Walking your dog is really most of what it takes to create a good farm dog, but we did put in the time to teach Lucy four basic commands --- sit, stay, come, and no. There are lots of books and websites that will tell you how to get those few commands into your dog's head, but once you've got her used to looking at you as the pack leader, it's pretty simple to train her. It's nearly as simple to train your dog to do things against her nature --- like leaving cats and chickens alone rather than eating them for dinner. When we brought home our first chickens, Lucy was extremely excited and I think she might have killed a chicken immediately if we'd let her. Instead, we took her for a long walk to calm her down and remind her who was in charge, then we made her sit and stay beside the chicken tractor. Every time the first bit of predator instinct kicked in and Lucy started getting excited about the chickens, we said "no" very firmly. After about 15 minutes of this, she understood. 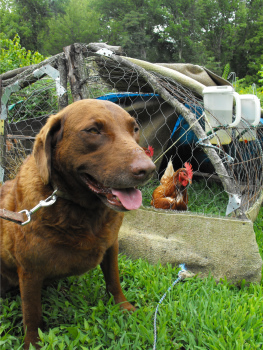 Now, when chickens accidentally get out of their tractors, Lucy has been known to try to help us herd them back in. When introducing your dog to "prey" animals, you should always have a way to enforce your commands. Your dog should be on a leash so that she can't lunge forward and grab the chicken. If you play your cards right, your dog will catch on very quickly and you'll be able to take the leash off and trust her alone with your livestock in short order.